JASPER, Ark. -- Authorities say a 20-year-old Briar Cliff University student has died after falling off a cliff in northwestern Arkansas. Wheeler says Norton was with a group of college students from Sioux City and was reportedly re-positioning herself for a photo when she fell about 100 feet off the Hawksbill Crag, a popular hiking destination within the Ozark-St. Francis National Forest. Norton was a native of Hot Springs, South Dakota. In a Facebook post Saturday night, Briar Cliff University called Norton "a passionate environmental science major, exemplary student and dedicated athlete. She lived BCU’s values in everything she did from the classroom to the court and everywhere she went." Briar Cliff University spokeswoman Leslie Heying said Sunday afternoon that the school may hold a memorial service of some type for Norton in the future, and that "plans are still being worked out with Andrea's family." "Counselors are currently assisting Briar Cliff students, faculty, staff and all who knew Andrea. A vigil for Andrea was held on Saturday evening on BCU’s campus for the Briar Cliff community," the school said in a statement. 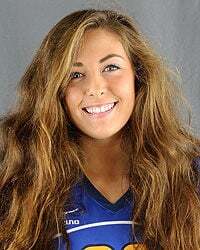 Norton was a junior middle blocker on the Briar Cliff women's volleyball team. The team took to Twitter late Saturday night to express their grief. "#22 on the courts, #1 in our hearts. Thank you for the prayers, calls, texts and emails," the Tweet said. Wheeler says the crag where Norton died is widely considered one of Arkansas' most-photographed hiking areas, and several people have died in falls there in recent years. Also known as Whitaker Point, the rocky outcrop gets its name because it resembles a hawk's bill. The Journal's Mason Dockter contributed to this report.